This application involved heating four steel laminate parts (c-lams) for a pre-heating application in the automotive industry. The parts, which are inserts, are heated simultaneously before robotic pick-and-place for plastic overmolding. The client was looking to change to induction from resistance heating. An EKOHEAT 15 kW/50-150 kHz system was chosen for this application. A thermocouple was attached to the top surface of each outer c-lams in the stack for temperature monitoring. The parts were successfully heated to the target temperature of 190°C (374 °C) within 10.0 seconds with the EKOHEAT, which met the client's objective. 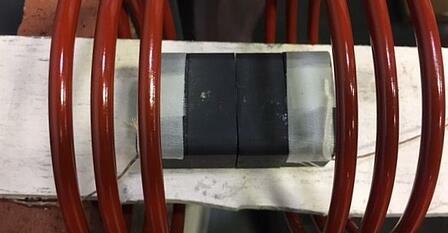 Speed, repeatability and energy efficiency led the client to consider induction heating over resistance heating. The guidance and expertise from THE LAB at Ambrell was another critical factor in their decision. To learn about other preheating applications evaluated by THE LAB at Ambrell, visit our website.